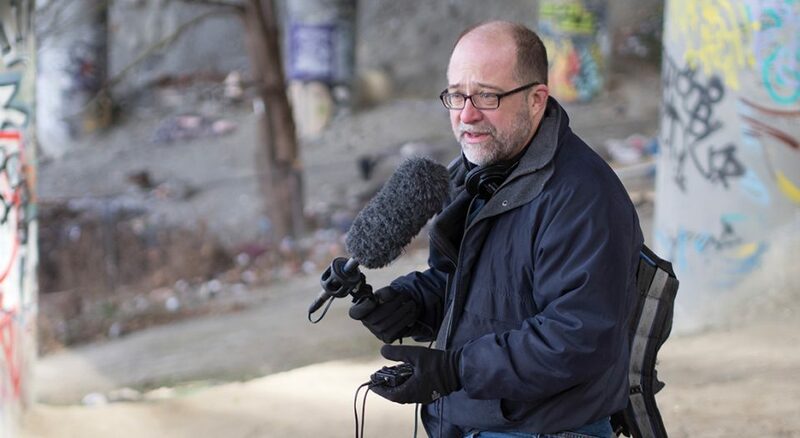 NPR reporter, Martin Kaste, works on a story at a homeless encampment in Seattle. I believe that man is not the measure, and the simple fact of existence is evidence of divine will. An issue I’m passionate about is preserving freedom of speech in 21st-century America. I worry about self-censorship growing in journalism, politics and academia. “Thinking out loud” is becoming dangerous in a society that doesn’t do forgiveness anymore. I pray for the strength to tolerate opinions I don’t like. Growing up with my father, Omar Kaste, a Lutheran pastor, meant that on Friday and Saturday nights, the sound of his manual typewriter was relentless. I still have the boxes of my dad’s sermons. He typed a lot of them on the blank sides of unused bulletins. To me, church is a place where we testify to each other about experiencing God in a world that denies his existence. I first had an interest in becoming a reporter while listening to the BBC World Service on shortwave when we lived in Brazil, where my dad was an American Lutheran Church missionary. One thing I wish people understood as they read, watch or listen to news coverage is that when a reporter failed to tell the story the way you would prefer, it probably wasn’t out of malice. My favorite Bible story is the often-overlooked ending to Jonah. It’s a wonderful cautionary tale for journalists. If you’re smugly sitting in the shade, waiting to see someone get punished, watch out: God may be about to send a worm to kill your shade tree. One of the stories I most enjoyed reporting on was the recovery of New Orleans after Hurricane Katrina. Having my reporting cited in the U.S. Supreme Court’s 2012 United States v. Jones ruling (concerning GPS tracking) was gratifying, even though I imagine only the justices’ law clerks actually read my stuff. I share my faith by not being apologetic about it. In a secular culture like Seattle, it can be a bit of a jolt (or witness?) when we cheerfully explain to acquaintances why we can’t make that Sunday morning soccer game, or that we try to contribute through our church to causes such as world hunger, sheltering the homeless or receiving a refugee family. It’s important to show that even though mainstream culture now dismisses Christianity, we—their friends and neighbors—are still part of the church. I’m a Lutheran because my parents and grand­parents and great-grandparents were, in Norway and Germany. It’s an accident of history, but I’m glad it happened that way. Plus, the music! It’s important to me to be involved in my congregation because it reminds me life is not all about me. People are surprised that I don’t like Twitter, given how many dumb things I’ve tweeted. To me, grace means freedom. Most people think everybody else knows what they’re doing.